View of high-rack aluminium composite panel storage. The storage system features a “honeycomb” type storage system for up to 1700 composite panel packings weighing up to 2250 kgs each. 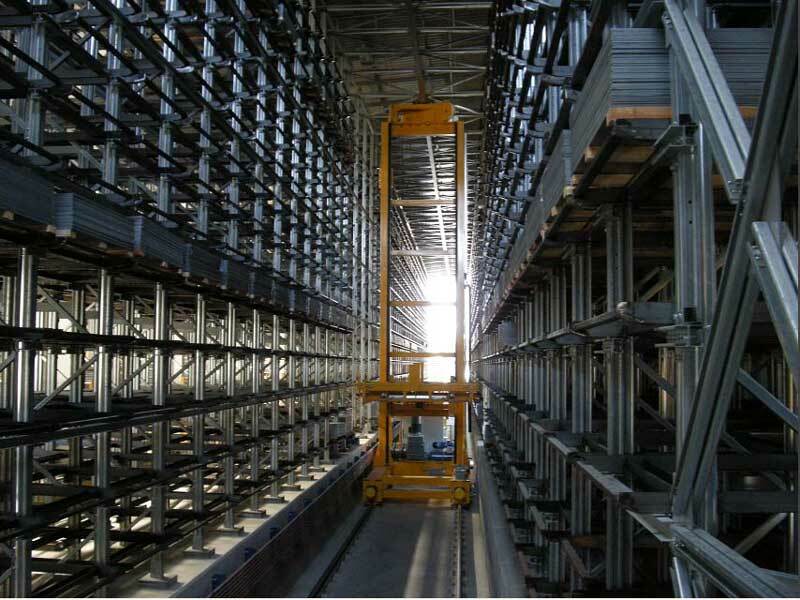 1700 packs of composite panels contained in the main honeycomb structure are stored and retrieved automatically in a structure measuring 10 metres high by 10 metres width and 86 metres in length. The composite panel packs in the “honeycomb” are transported and stored flat and measure up to 2000 mm by 3200 and maximum 420mm height – although the most part are standard dimensions of 1250 mm by 3200 and maximum 420mm height. 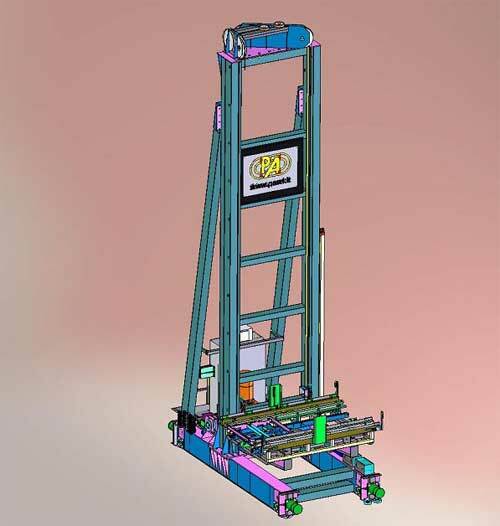 Cycle time for the “picker” is maximum one panel every 3 minutes for the retrieving or positioning of a single composite panel which allows for an extremely high turnover in the plant (up to 60 panels per hour). The maximum speed of the “picker”, as chosen by the customer, is up to 100 metres per minute for the lengthwise speed, 20 metres per minute for loading / unloading speed and a lifting / lowering speed of up to 20 metres per minute. The measurements of the panels are checked electronically during the loading / unloading cycles as a cross check to prevent the wrong panel from being mis-coded or put in the wrong position in the storage system. All composite panels are loaded and unloaded automatically onto underframes used in the high rack storage system which improves operation and ensures that panels are not at risk of damage. 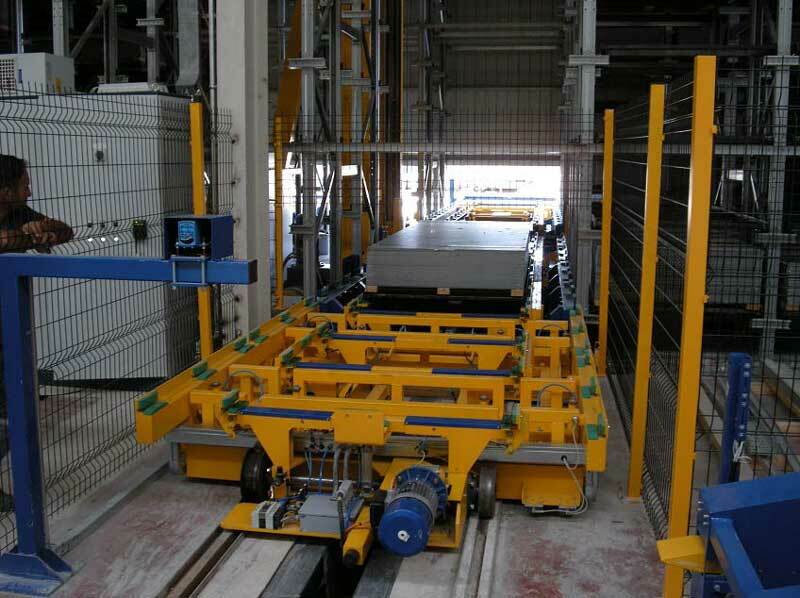 Image of automatic loading / unloading of panels onto underframes. 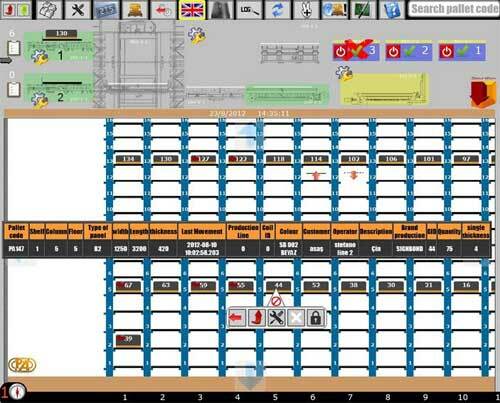 As well as supplying the framework and robot “picker” we are also supplying all the software needed for running the storage system which is to be integrated into the complete system used by the customer. It will also be possible to associate this database information with a detailed drawing of the panel to allow the visualization of the panel itself and cross referencing. At the present time, the panel codes are inserted automatically using barcode labels attached to each panel. The storage system, which is to be positioned against an outside wall of the factory, has been covered with a roof and insulating panels as well as a bracing structure to ensure full stability in harsh climatic conditions (strong winds for example) as well as being anti-seismic.